A lot of people don’t like change. People will fight change, but change is good sometimes. You can’t become OR you can’t be a Christian without change. From the moment we become a Christian, we begin to change – we should change because we become new creatures in CHRIST. The good news is that it’s JESUS that gives us the ability and strength to change. We are HIS workmanship, HIS creation, created for HIS purpose. We need to change. The old man is washed away and ALL things are made new. We are here to spread the gospel and not be ashamed of it. When the opportunity comes up, we need to jump in and tell people about JESUS. I remember when Dee and I were in Menards and I started talking to this young worker gal. I asked how she was doing and she said she would be better if I was a chiropractor because she had shoulder pain and discomfort when she moved it a certain way. I told her I’m not a doctor but I am a believer and I will pray for a healing. She smiled and I prayed a healing touch in her in JESUS name. She had tears in her eyes and thanked me. I said give GOD the Glory. She told me she just got back with the LORD a few weeks ago because her boyfriend is a believer. I invited her to church and gave her some testimonies from JAM. She was excited and still had tears in her eyes. 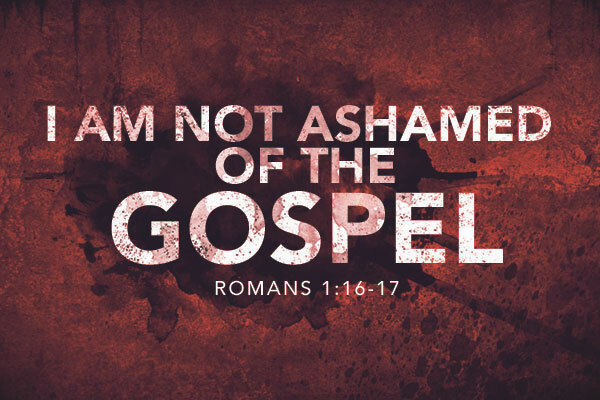 It’s all about JESUS and don’t be ashamed of the GOSPEL of JESUS CHRIST. This passage was written when Rome was in power. Rome was an Empire filled with pride. They were in power for over 200 years. Pride came from what a person owned or their social status. The Pride was everywhere. Pride is a destructive thing. Too many people hold onto their pride and live their lives like they’re better than others. We need to let people know that there is a much stronger Hope in JESUS than anything the world has to offer. At school, work, or play can people look at you and they know you made a commitment to JESUS, or is it something you try to hide? Do people know the stand you have taken for JESUS? Your family, friends, neighbors, co-workers, or are you keeping that a secret?